Comfort and control in a box. Dealing with temperature imbalance? This is a common issue in new and old buildings as most commercial HVAC systems don't feature smart, IoT-based sensing and zone controls. 75F's solutions provide zone dampers and HVAC zoning controls to improve existing systems and adjust for varying zone temperatures, changes in the weather and occupancy patterns and more to deliver a consistent, balanced indoor environment. Want to learn more about how 75F's zone dampers and controls can impact your commercial building? Download our Internet of Comfort white paper for tangible, measurable benefits of providing a more comfortable indoor environment! Download the Internet of Comfort White Paper Today! The 75F Smart Stat provides an integrated in-room, wall-mounted user interface, with 7 onboard sensors and thermostat zone controls for dual-stage HVAC equipment. SmartStat can control a range of equipment to support comfortable, healthy and efficient buildings. Perfect for office spaces, conference rooms, hotel rooms, patient rooms and other environments where individual zone sensing, display and controls are desired. 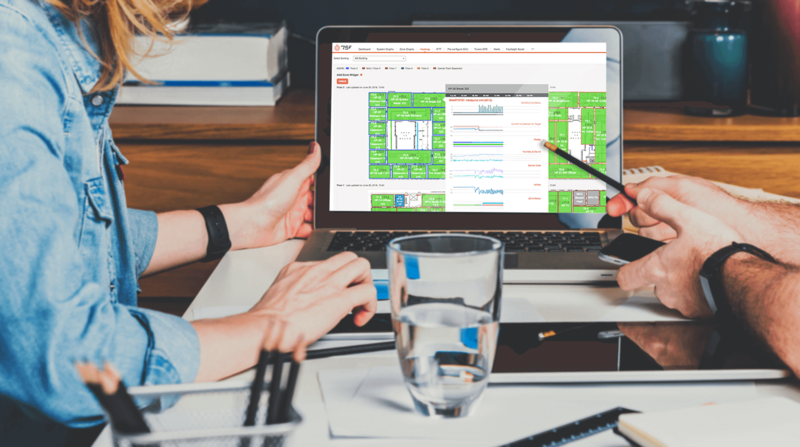 Web and mobile remote monitoring, plus predictive proactive HVAC controls, as part of the 75F vertically integrated building intelligence suite. The 75F Occupant App for iPhone and Android empowers employees and tenants to tailor their space with zone-specific controls for temperature and lighting. Your building occupants can set temperatures, adjust the lighting, and set vacation schedules all from their phones. With geofencing capabilities enabled, the 75F system can sense occupants approaching a defined area, anticipate their arrival and pre-condition their space to meet individual preferences. We build a vast data model by ingesting over a million data points every day per site. Proprietary algorithms analyze and combine the data with weather forecasts in order to send the optimal control strategy to the Central Control Unit, which sends instructions to incrementally move smart dampers a few degrees at a time, creating even temperatures throughout your building. The system creates a continuous dialog between multiple Rooftop Units (RTUs) in your building, ensuring they work together to reduce energy usage. 75F Facilisight is a suite of web and mobile apps which allow you to remotely monitor and control your HVAC, lighting and energy management systems across all your sites. Our system uses real-time sensor and weather data to predictively and proactively manage building temperature, lighting, and more. View your entire portfolio, compare energy data across sites, and set schedules with a single click.